Fredrix Watercolor Canvas Pad, 12x16"
Home > PAPER & BOARDS > Watercolor Paper > Fredrix Watercolor Canvas Pad, 12x16"
A Unique Watercolor Experience! 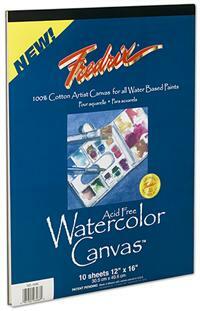 Fredrix Watercolor canvas is a revolutionary new watercolor surface made of 100% Cotton. The unique texture of an all natural woven material, in combination with a proprietary patented specially formulated acid-free coating, delivers a unique new watercolor painting experience and distinctive look that can only be captured on canvas. Fredrix Watercolor Canvas Pad is a 100% cotton artist canvas which combines the texture of a natural, woven fabric with a specially formulated gesso designed for all water-based paints. It is versatile and durable. It will not tear like paper and you can lightly lift out pigment or completely wash out your painting surface without damaging the canvas surface. You must staple or mount the canvas sheets to a hard board surface before painting.